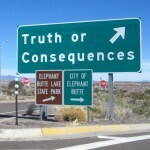 Column #HR78 Things that go bump in the night! 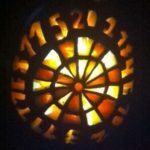 For the non-dart world that’s the celebration of the event called Halloween or All Hallows Eve. On that night while little kids are dressing up like ghosts, witches, pirates or Paris Hilton many men dress up like women. In some places like Las Vegas and San Francisco they seem to celebrate All Hallows Eve 365 days per while singing Michael Bolton love songs. Go figure. Best not try the “who are you going to believe me or your lying eyes” approach. In the old Northern California Dart League where the Old Dart Coach tried to hone his limited skills, “rooks” would occasionally try that excuse. It was met with, “then don’t aim at the wires.” Simple and wise advice, usually delivered by one of the Smith brothers. Philip Taylor can’t use that excuse for his early exit from the World Grand Prix. Before you ax the question, “Prix” does not rhyme with “Nick” regardless of what the ODC was told as a youngster by his late father. The dispatcher of Taylor was Scotchman Robert Thornton. The event was held in, well, Dublin where the crowd is usually well-fueled and boisterous, bordering on riot status. Not this time. Yes, they still play dress up so maybe every dart day in the Emerald Isle is Halloween. The best? A pair of matching dancing bananas. Hard to beat dancing bananas. The spirit of the crowd did pick up when the walk on girls arrived. Now there’s a real treat. Taylor should have won the final set 3-1 except he missed the dead bull from a 130 exit, giving Thornton a second chance for the set win which he accepted with double 4 to level at 2. In the decider both players got the starting double with their first trip to the oche. Taylor’s approach was a masterpiece as three yielded 177 to leave 86 after 12 darts. Thornton got to 140. The “real” Phil Taylor nailed the treble 18 leaving two darts to make 32 go the way of brass darts. With the match there for the taking Taylor missed both! Of course, Thornton needed a treble 20 (during the match Thornton had tossed some 75 of them little dandies). But the triple 20 goes wanting, handing the hammer back to Taylor. Can Taylor miss three (more!) 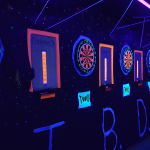 darts at double 16? Not a chance. But he did. Two outside and the third inside. Talk about things that go “bump in the night”! This Grand Prix had seeds falling the way Johnny Appleseed did walking through the orchard. Never did figure out why he was walking through an orchard tossing seeds. Was he seeding weeds? Dufus. World Champion Adrian Lewis went out 3-1 to Michael van Gerwen with James Wade and Gary Anderson also getting the bum’s rush. Eight of the top 10 seeds were gone after the first two rounds. As often happens, the player that beats Taylor goes out the next round. Thornton crashed out without firing a shot 0-3 to Mervyn King (with sets of 3-2, 3-1, 3-1). In the end, Dutchman Michael van Gerwen won his first major as he came from behind to defeat Mervyn King 6-4. Playing the best of 11 sets van Gerwen was down 4-1 which should have been 3-2 but for 6 missed darts at a double. van Gerwen with two “snyder sets” (3-0) moved closer at 4-3. Things got level at 4 with a nifty 3-1 win set for van Gerwen. The sets are level when King again misses tops. Like a good breakfast a good start makes things better. 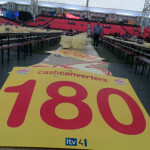 van Gerwen starts 152, then hit 139 with tops for the win and set. The 10th set was all van Gerwen thanks to a treat from King. Down 0-1, King misses 3 to level the set. 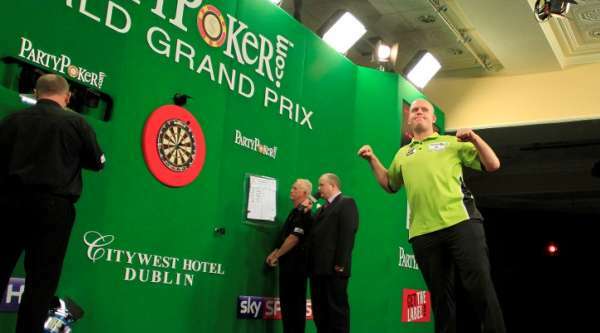 van Gerwen wins £100,000 and his first major taking 140 from the score sheet. Meanwhile in Dayton, Ohio the New World Darts Series was dangling a $4,800 treat for male darters – at least for the one that “merged” triumphant. The ladies winner would have $1,000 to add to her bag of goodies. A tasty treat for all with costumes optional. The gents final would match Larry Butler against Scott Wollaston in the best of 15. Leading 7-5 Wollaston put together a leg of about 14 darts for the 8-5 win. Tip of the Halloween chapeau to David Irate, not pronounced “Eye Rate,” for the live stream. With two cameras and probably a non-existent production budget and a less than stimulating set he did real good. One viewer emailed the ODC, “The stream needed you.” The ODC answered, “No one axed.” The email person was referring to the brilliant work of the ODC and Chris Berman back in the day on ESPN with the Challenge of Champions. Whatever happened to that Berman guy? Hope he’s doing well. The ODC has gotten a little smarter which most agree wouldn’t be too difficult. He doesn’t offer free advice because it’s usually overlooked or made sport of. The ODC doesn’t handle “make sport of” well. Very hurtful. At the New World Dart Series the ladies singles was won by Paula Murphy over Andrea Taylor. A guest female commentator said during the match, “These are two great dart players.” That might be true but neither showed any semblance of “great” on stage in the finals. A commentator should never make a statement that the viewers’ eyes will reject. Great American female darts players were/are Kathy Karpowich, Sandy Retain, Kathy Mahoney, and Stacy Bromberg. Case closed.